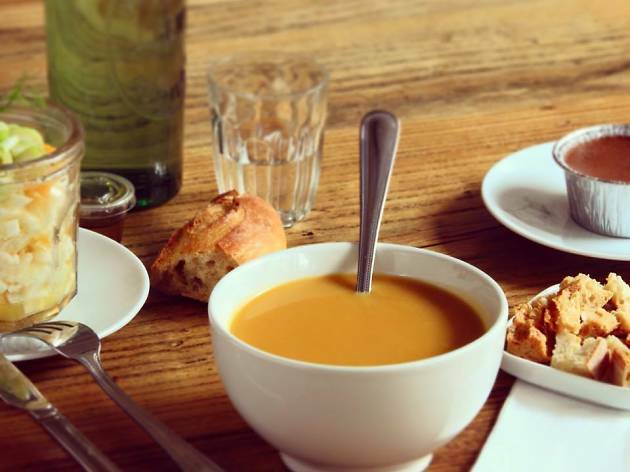 Pass by the violet façade of 37 Rue de Montreuil and this charming soup bar is sure to catch your eye: La Cuillère serves food that is both healthy and filling, unpretentious and refined. The restaurant has a huge dining area, with a shabby-chic décor of exposed bricks, copper piping and mismatched furniture. Owner Tina runs an open kitchen (sectioned off from the restaurant by a glass window), and can be seen preparing her own tasty soups and tarts with the freshest, seasonal ingredients. The menu is delicious and very affordable at €9.50 for a starter and soup (€13.50 with dessert and a soft drink). Everything is homemade and available to take away. La Cuillère is first and foremost a lunch canteen, packed to the rafters every afternoon. Although mostly empty during our evening visit, the restaurant had been so busy for lunch that the kitchen had run out of several ingredients, forcing Tina to re-work the dinner menu. For starters, we opted for the divine feta and chicory tart and for the prune and celeriac salad, which was perfect in its fresh simplicity. 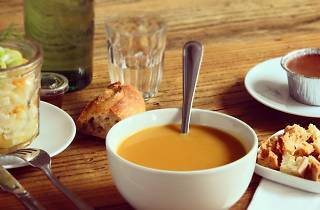 We sipped Ch’ti beer and a Luberon wine – both organic – while awaiting the main event, our soups: a hearty vegetable potage, and a delicate beef bouillon stewed with semolina and veggies. Dessert was banana-stuffed mochi and a tiramisu, which ended the meal beautifully.